We occasionally have available for sell the following Quinces: Vranja, Meech’s Prolific, Serbian Gold Smyrna and Portugal and are often asked how well they do in Scotland.Here are some notes gleaned from various articles and personal experience. 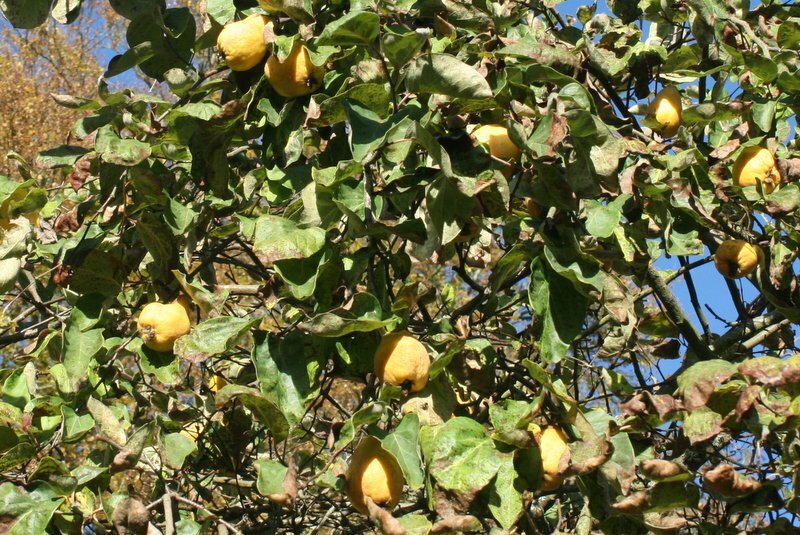 The quince, Cydonia oblonga, famous for Cotignac and Marmalade, is a tree that can grow to 4 or 5m. It is probably native to Central Asia and the near East ( WJ Bean, 1970), but has been cultivated for many centuries. They were much esteemed in Italy, and Sanders suggests the Romans introduced them to Britain, and they reputedly grow wild in Sussex. Today they are still highly esteemed from southern Europe to as far as South America.In France they are called ‘Coins’. It forms a rather scruffy bush or small tree, with a multitude of intertwining branches if not pruned. Autumn leaf colour can be very nice. They need a bit of cold in winter to promote flowering. Hogg (1886) surprisingly only mentions apple shaped, pear shaped or Portugal types and no record of Victorian varieties. Bean names the Portugal variety as ‘Lusitanica’, Maliformis’ as the apple shaped and only two cultivars, Vranja and Bereczki. Angers quince A , B and C are two selections used for producing dwarf pear trees. The Portuguese: Pear shaped, vigorous, but slow to crop. Vranja: ( Bereczki) From Serbia, large fruited, pear shaped erect growing tree. Meech’s Prolific: Pear shaped, early to bear and late keeper. This comes from USA. Isaphan and Maliformis, are mentioned, and Orange, Pineapple and Smyrna occur in the US. Importantly he mentions they are self-fertile though others suggest cross-pollination improves fertility. They flower in June in this country, a big open flower, white or pink. They are generally grown as a low standard / bush tree. I have rarely seen then pruned or trained in Scotland, but there is no reason why they cannot be trained to whatever shape you want. There is a garden in Church Stretton which has a wall topped with a pleached quince ‘’hedge’’. This proves that they can be trained! So ok to train them up a wall or fence. Frequently quince bushes can appear from the rootstock of a pear that has died – though i have not seen any fruit on these. Quinces can be entirely left to their own devices, but ideally trees should regularly have some of the internal branches taken out to reduce the amount of congestion. 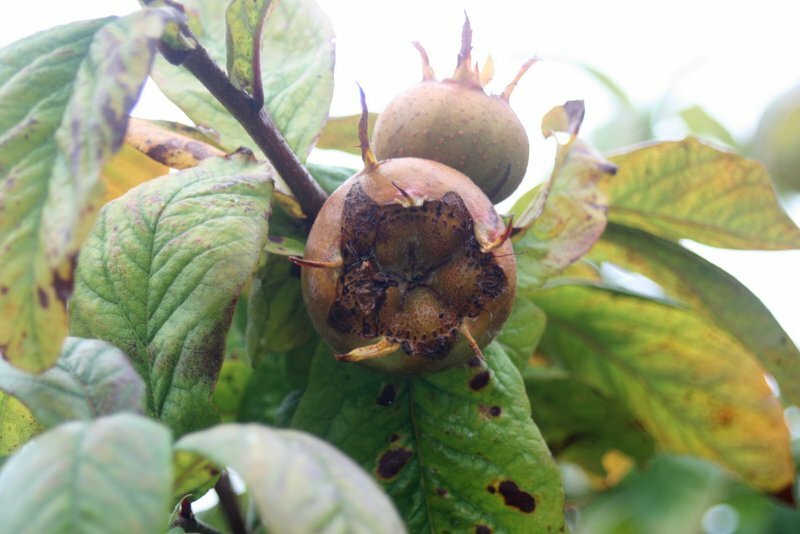 Sunny, warm, and well-drained sites are preferred, avoid cold frost pockets.They are susceptible to leaf blight, especially any overgrown rootstocks, but larger specimens seem to be more resistant in Scotland. 40 years ago in South America school children were given Quinces for their packed lunch, which they ate raw with salt! However, in our climate they are generally used for jelly, jam or ‘cheese’.They are highly aromatic when ripe, and can be stored to ripen if necessary. Other varieties available from UK Nurseries include Akvambari, Ekmek, Isofahan, Sobu, Seibosa, and Shams from Turkey and Iran. The RHS suggest pruning all leaders on new tree to outward facing buds; this would promote a more open and wider bush. Allow at least 3 m between trees ideally. The fruit is highly aromatic and can be used in small quantities to flavour apple pies etc. There are 16 entries in the RHS Hardy Plant Finder under Cydonia. Portugal is the probably the best quality but not so easy to grow here. Vranja and Meech’s Prolific, Smyrna and Serbian Gold are likely to be the more reliable here. They are easy to grow in any sheltered place in Scotland so why not give them a try? Flowerdew, Bob, Complete Fruit Book, 1997. Bean WJ, revised 1970 ed. Trees and Shrubs Hardy in The British Isle. Encyclopeadia of Gardening, RHS, 1992, Page 386. RHS Hardy Plant Finder 2004-2005. Medlars are rather plain looking trees – admittedly they are rosaceae, but the flowers are just white amongst many other better rosaceae, so why are they of interest? They have been cultivated for thousands of years, and its very likely the Romans brought them here. Well its the fruit, which is not quite like anything else! They are actually pomes, and are brown, earthy tasting and either hard or soft and almost rotten! They are about 5cm across and brown.We tried some at The Harmony garden at Melrose once, and they were definitely an acquired taste. They are in fact a useful late fruit as they aren’t ready until mid- winter. So what are they used for. Traditionally they need to be ‘bletted’ i.e. until the frost has softened them. Some suggest this isn’t actually necessary.However, the best use of them is to make into jam or jelly. They will grow almost anywhere, I have seen them at Kellie Castle in the lawn, and in a hedgerow at Broughty Ferry. Remembering where they are and getting the fruit is important if they’re in a hedgerow. Varieties generally available are the Dutch ( largest fruit), Nottingham ( more upright), and the Royal ( better flavour). Also Breda Giant and Russian clones. We sell Nottingham. All are self-fertile.Named varieties can be grown on Pear, Quince or Hawthorn. They come from the Caucasus, so cold winters and hot dry summers are a clue to their requirements. The dry warm soils of Broughty Ferry is probably about right. Bob Flowerdew suggests only remedial pruning as they fruit on the ends of shoots. The RHS suggest the following: ‘’pick when the stalk parts from the tree in late Autumn, and dip the ends in in strong salt solution to prevent rotting…..store with calyces downward, on slatted trays. Use when the flesh is brown and soft’’. Ooh I almost forgot to mention, they have lovely autumn colour! Flowerdew, Bob, Complete Fruit Book, 1997, page 169. RHS Encyclopaedia of Gardening, Ed. C. Brickell, 1992, page 387. Tree Fruit Growing, Raymond Bush, 1962, pages 288-289.